GC and Memory Allocation (MemoryDiagnoser) which is cross platform, built-in and is not enabled by default anymore. Please see Adam Sitnik's blog post for all the details. JIT Tail Call Events (TailCallDiagnoser). You can find this diagnoser as well as the (InliningDiagnoser) in a separate package with diagnosers for Windows (BenchmarkDotNet.Diagnostics.Windows): Please see this post for all the details. Hardware Counter Diagnoser. You can find this diagnoser in a separate package with diagnosers for Windows (BenchmarkDotNet.Diagnostics.Windows): . Please see Adam Sitnik's blog post for all the details. Disassembly Diagnoser. It allows you to disassemble the benchmarked code to asm, IL and C#/F#. Please see Adam Sitnik's blog post for all the details. Concurrency Visualizer Profiler (ConcurrencyVisualizerProfiler) It uses EtwProfiler to profile the code using ETW and create not only .etl file but also a CVTrace file which can be opened by Concurrency Visualizer plugin from Visual Studio. In BenchmarkDotNet, 1kB = 1024B, 1MB = 1024kB, and so on. In order to not affect main results we perform a separate run if any diagnoser is used. That's why it might take more time to execute benchmarks. Mono currently does not expose any api to get the number of allocated bytes. That's why our Mono users will get ? in Allocated column. In order to get the number of allocated bytes in cross platform way we are using GC.GetAllocatedBytesForCurrentThread which recently got exposed for netcoreapp1.1. That's why BenchmarkDotNet does not support netcoreapp1.0 from version 0.10.1. MemoryDiagnoser is 99.5% accurate about allocated memory when using default settings or Job.ShortRun (or any longer job than it). 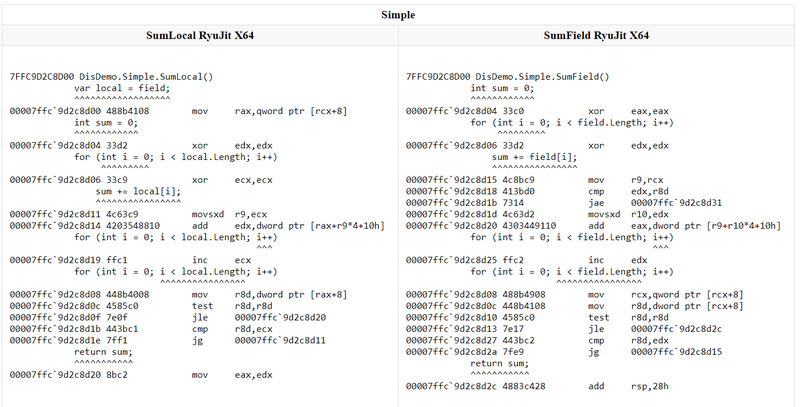 Mono disassembler does not support recursive disassembling and produces output without IL and C#. Indirect calls are not tracked. This diagnoser is not enabled in explicit way as the other diagnosers. You need to specify [HardwareCounters] and we choose the right diagnoser in the runtime. You can use a single config to compare the generated assembly code for ALL JITs. But to allow benchmarking any target platform architecture the project which defines benchmarks has to target AnyCPU. The disassembly result can be obtained here. The file was too big to embed it in this doc page. Getting only the Disassembly without running the benchmarks for a long time. Sometimes you might be interested only in the disassembly, not the results of the benchmarks. In that case you can use Job.Dry which runs the benchmark only once. logFailuresOnly: Track only the methods that failed to get tail called. True by default. filterByNamespace : Track only the methods from declaring type's namespace. Set to false if you want to see all Jit tail events. True by default.